John Nikas in a 1953 Austin-Healey 100 that he plans to drive through 50 states this summer. 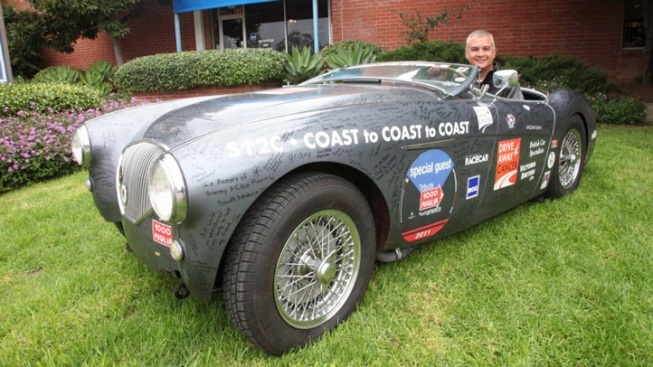 There are about 6,500 names written in black Sharpie marker on John Nikas' 1953 Austin-Healey 100 -- a vintage British sports car that, despite protest from every dashboard warning light and two fires, soldiered through a 5,800-mile coast-to-coast-to-coast drive last year that started as a way to inspire a friend diagnosed with cancer. Some of the names are those of people battling the disease. They found inspiration in a rickety odds-defying car that somehow sputtered from Orange County to South Carolina and back west to Monterey. Fifty-six of the names are people who have died since Nikas and the car, aka "Grace," began their two-week journey last summer. For their families, the car became a rolling memorial. "Last year, we thought we were going on a drive to raise cancer awareness," said Nikas, who races vintage cars. "We didn't understand at the time the Grace would become an instrument of healing. It's amazing to hear from people who are sick who think if this car can stay on the road, so can they. It's a good metaphor." Nikas, of Irvine, and "Grace" will set out on another journey Tuesday from Autobooks-Aerobooks in Burbank -- 50,000 miles through 50 states as part of the Drive Away Cancer project. The trip includes scheduled stops at hospitals, car shows and meetings with people who heard about the little Austin-Healey that could. [UPDATE: Wednesday, 11:18 a.m.] Nikas left Tuesday afternoon. Track his progress here. Again, Nikas will bring his Sharpie markers and more names will be added to "Grace." Some of the names have messages scrawled next to them. One father wrote to his daughter, "Fight like a girl." Another message reads, "Dad, you would have loved this." A man in North Carolina signed his wife's name and asked Nikas to take her somewhere special -- California. In South Carolina, Hammond Edward added his father's name to the car. "It's nice knowing my father's memory is along for the ride," said Edward. There are celebrities' names on there somewhere, Nikas would have to look to find them -- but he can easily point to every name of a child. And, it's a horse drawn prominently on the center of the car's hood that gets the most attention. The horse was created by Amy from Arkansas -- a girl who coped with the agony of chemotherapy by finding comfort in her artistry. Amy died in February, but their 45-minute conversation last summer and the horse on the hood will always be with Nikas. "People always remark on the horse on the hood -- it's one of those things that you just never know what will have an effect on someone later on," said Nikas, who has taken the car to seven funerals. Last summer's two-week trip was an array of glitches, fires, hysterical warning lights, nearly 300 quarts of oil and all-night repair jobs, some with help from strangers. Nikas estimates the car broke down about once every three hours on the road. But out of drastic drops in oil pressure and other near-disasters came names and memories. "Every signature last year was at a rest stop, gas station, or breakdown on the side of a road," Nikas said. Along the upcoming 50-state journey, more parts will probably fall off. Pieces are placed in plastic baggies and sent to people who request a part of "Grace." "The thought of not going back out would be a surprise because so many people expect us to keep it on road as long as possible," Nikas said. At Bob's Big Boy in Burbank Friday night, the squat little Healey was hard to spot among bulging muscle cars and the substantial amount of metal and chrome used to forge American classics. People stopped by to ask about his plans for the British sports car. Was it going up for auction? Is he restoring it? What are all the names about? No plans for a sweeping overhaul -- that would defeat "Grace's" purpose. Nikas and friends with the Austin-Healey Club of Southern California made Grace road worthy over the course of eight days before the 2011 drive. 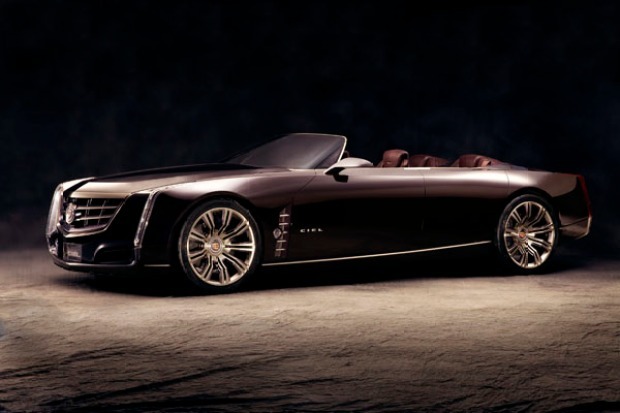 He could have just used a Toyota Camry, but the Healey turns heads -- no matter that some of those heads are shaking in disbelief. "I'd like to say it has improved, but honestly she might have gotten worse," Nikas said. "But if you talked to anybody involved, they don't want her repaired. So, the essential character of the car remains the same -- she still catches fire and still breaks down. You never know when the last mile is going to happen, and you shake your head that it's still here." The most catastrophic -- there are several degrees of catastrophe when it comes to vintage British sports cars -- failure last summer occurred in Shamrock, Texas. But like many of Grace's breakdowns, it wasn't terminal -- thanks to a woman who heard about the car's plight from a Facebook friend, loaded up her husband's truck and trailer, and drove hundreds of miles to pick up the car so it could be brought to a repair shop. "The best parts were the worst parts," Nikas said. The car started out as an eBay purchase by the man who was the original inspiration for the restoration project that led to Drive Away Cancer -- Nikas' friend and Austin-Healey club member Mike Newsome. After Newsome was diagnosed with multiple myeloma, Nikas and friends decided to restore the car. "We really just wanted to make Mike happy when he got sick," said Nikas. "When he got diagnosed, we weren't sure he would make it to the end of the drive -- now, he's doing great." 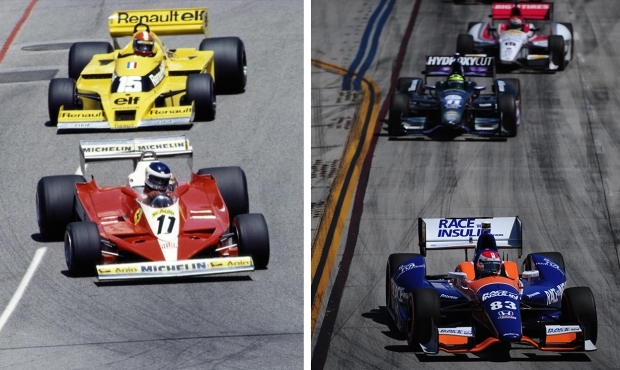 Drive Away Cancer 2012 is scheduled to end up in Monterey for the Rolex Motorsports Reunion weekend in mid-August.